Honda Pumps are the best in the business. They have the proven results of the legendary Honda 4-stroke engine, which is the heart of any pump and key to the pump's reliability. Honda pumps utilize silicon carbide seals, cast iron impellers and rigid mounted volutes to achieve superior performance, day in and day out. Gulf Marine is an authorized retailer and service center for Honda products. Give us a call with any questions or for any assistance. The WX10 weighs in at only 13 lbs. so moving it around is easy. 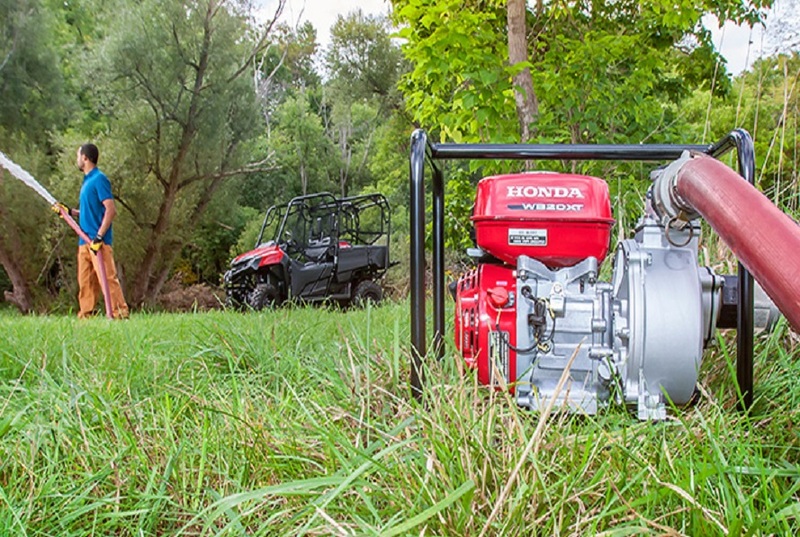 With the durable Honda GX series commercial grade engine, performance is strong at 32 gal./min capacity from the lightweight general purpose 1" pump. The durable Honda GX series commercial grade engine is easy starting and provides ample power for the toughest conditions. The WB20's exclusive, Honda-designed 4 vane impeller offers improved performance and high efficiency. The Easy starting Honda OHV commercial engine, General purpose, centrifugal 2" pump brings a 164 gal./min. capacity. The heavy duty full frame design protects the pump and provides a handy tie-down position when transporting. The WH15 is designed for high pressure needs. The high pressure 1.5" centrifugal pump has a maximum pressure of 57 psi and a 98 gal./min. capacity. Enjoy ease of use with the easy starting Honda OHV commercial engine, lightweight aluminum case and perfectly place carry handle. The WMP20 features EPDM seals, a type of rubber material that is designed to be compatible with a wide range of chemicals. Add in the easy starting Honda OHV commercial engine, multi-purpose 2" pump with a 220 gal./min capacity and thermoplastic pump housing for chemical capability and you have a durable and versatile workhorse. The WT30 comes with a Heavy-duty 3" construction trash pump specially designed for job sites and applications where high volume trash water capacity is needed. It has a solid handling capability up to 1 1/16" and a 317 gal./min capacity. The Cast iron volute, impeller quick clean out port and included service tool makes operation easy.